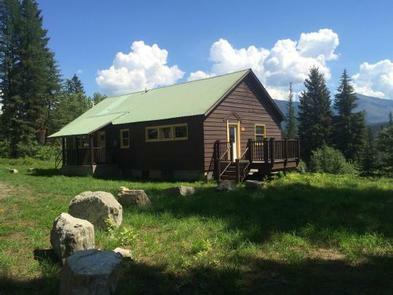 Anna Creek Cabin is located 30 miles south of the town of Hungry Horse, perched above Hungry Horse Reservoir with sweeping views of the reservoir and the Great Bear Wilderness. 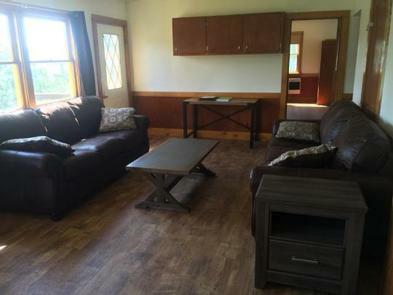 The cabin provides a private setting to enjoy the recreation opportunities along the west side of Hungry Horse Reservoir. Located halfway down the reservoir, the cabin provides a delightful setting for viewing wildlife and enjoying the peaceful surrounding. The cabin is set up above the West Side Hungry Horse Reservoir road providing privacy and scenic views. The west side of the cabin and large parking area backs up to the forest with Anna creek flowing through. The east side of the cabin offers open views of the Great Bear Wilderness. The site offers a nice mix of shade and sun. The cabin location provides a base to explore the numerous recreation opportunities along the west side of Hungry Horse Reservoir. Visitors can access the water within a short drive to Graves Bay, Graves Creek or Handkerchief Lake for fishing, swimming or boating. Access to hiking trails along pioneer ridge or the east side of Jewel Basin is in close proximity to the cabin. Other popular activities such as driving for pleasure, berry picking, wildlife watching, and fishing are abundant in the area around the cabin. 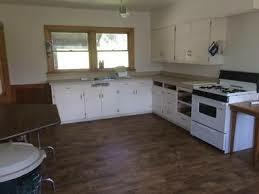 This single story cabin is equipped with a propane cook stove, heater, lights, and an accessible vault toilet. 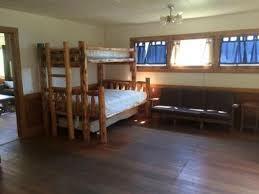 Indoor accommodations sleep up to 12 people on one double bed, two twin beds, two double/twin bunk beds, plus two twin roll-out trundle beds. Outside, enjoy the campfire pit with barbecue grate and the deck on the south side of the cabin. No drinking water or electricity is available. Guests should bring plenty of water, bedding, food, flashlights, and basic camping gear, among other necessities. Grizzly bears frequent the area; use appropriate containers for food and garbage. Read more at our Food Storage Order and Grizzly Bear Safety page. Pets are allowed at the cabin. Pet food should be kept inside at all times. Clean up after your pet. Water is not available at the site. Be sure to bring all your water for your visit. Anna Creek flows for most of the season. Boil or treat any water from streams or lakes. Please bring garbage bags; this is a "pack-it-in, pack-it-out" facility. Conserve propane by minimizing the use of lights and turning off the heaters while away from the cabin. Contact the ranger district office at (406) 387-3800, during business hours (Monday through Friday, 8 a.m. to 4:30 p.m.) for updates on weather and road conditions; refunds will not be given for inclement weather or road conditions. The cabin remains locked; a combination lock code will be contained in the reservation confirmation letter. Guests must clean cabin prior to departure; a fee will be charged if extra clean-up is needed. Commercial use of cabin is prohibited. 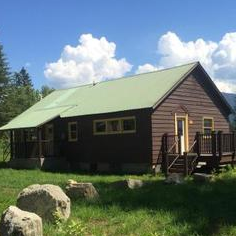 Anna Creek Cabin is located 30 miles from Hungry Horse, MT on the West Side Hungry Horse Reservoir Road (895). From Hungry Horse, turn south on Road 895, cross the Hungry Horse Dam and continue 29 miles on the west side of Hungry Horse Reservoir to the cabin. The cabin is located on the west side of the road between mile marker 28 and 29, accessed via a short driveway. Be sure to close the gate behind you on your way up to the cabin.